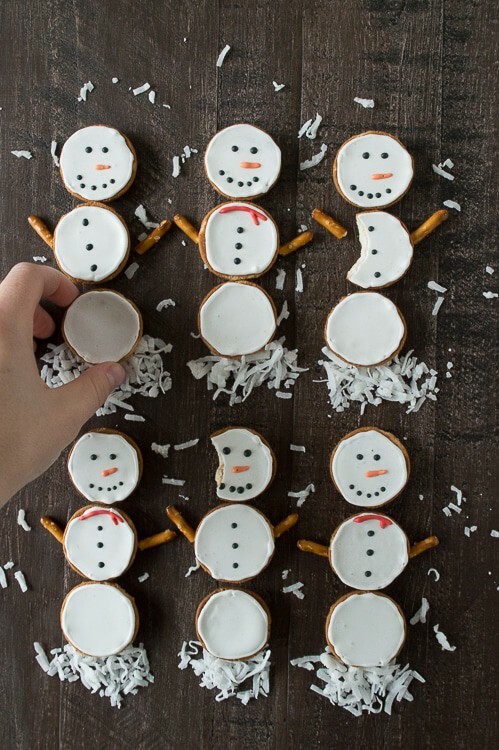 Make these simple snowmen cookies using nilla wafers and royal icing! 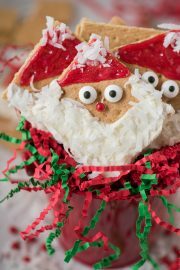 I don’t think there is such a thing as too many christmas cookie recipes, so we’re going to add another one to the collection. And this one is super easy because it uses Nilla Wafers. Which means there is no rolling, cookie cutters, or baking involved! Nilla wafer don’t have the same texture as a soft-baked sugar cookie, but this recipe is intended to be quick and easy. These nilla wafer snowmen would be great for your kids’ school party, or you could use the nilla wafer snowmen to decorate gingerbread houses or as decoration on a holiday cake or to decorate another dessert. If all else fails, give them to your preschooler.. they will love eating snowmen cookies, regardless if they are more crunchy. Serves: as many as you want! 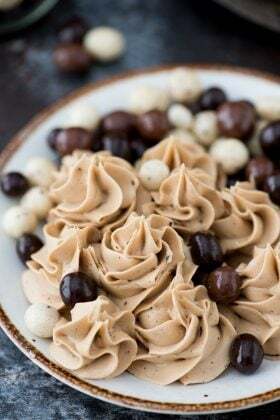 Combine the powdered sugar, meringue powder, and water in a mixing bowl and mix on low speed until the icing has a matte appearance, about 7-10 minutes. Transfer some of the icing to a squeeze bottle and cover the rest of the frosting in the bowl with a damp washcloth. This is to prevent the icing from hardening. Begin to outline the edges of the nilla wafers. It is best to have your arm and hand resting comfortable on a table. Continue until all of the nilla wafers are outlined. Clean the squeeze bottle as you will need it again, or use another squeeze bottle. Reserve a small amount of white icing in another container. This icing will be used to make the snowman’s eyes, mouth, nose, buttons, and scarf. Cover this container with a damp washcloth as well. Use the remaining icing to flood the nilla wafers. In order to do that, you will need to add more water to the icing so the consistency is thinner. Add 1 tsp of water at a time, stirring by hand, until the icing runs off the back of a spoon. Transfer some of the more watery icing to the squeeze bottle. Begin to flood the nilla wafers with icing, using a tooth pick to help spread the icing to the edges. You don’t want to add too much icing, as this could cause the icing to overflow beyond the edges. 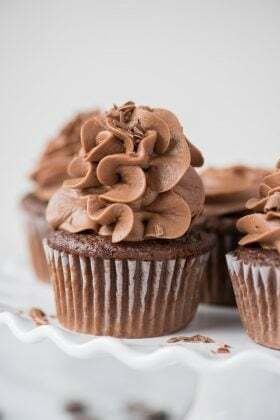 Practice until you know how much icing you need. Refill the bottle as needed with icing and continue to flood all of the nilla wafers. Allow the frosting to set and dry completely before adding the snowman’s details. Depending on how many wafers you are using some of them might be dry by the time you finish flooding. Otherwise wait until the icing is dry, which could be up to 1 hour. Once the icing is dry you will want to start forming groups of 3 wafers. Each snowman needs 3 wafers. 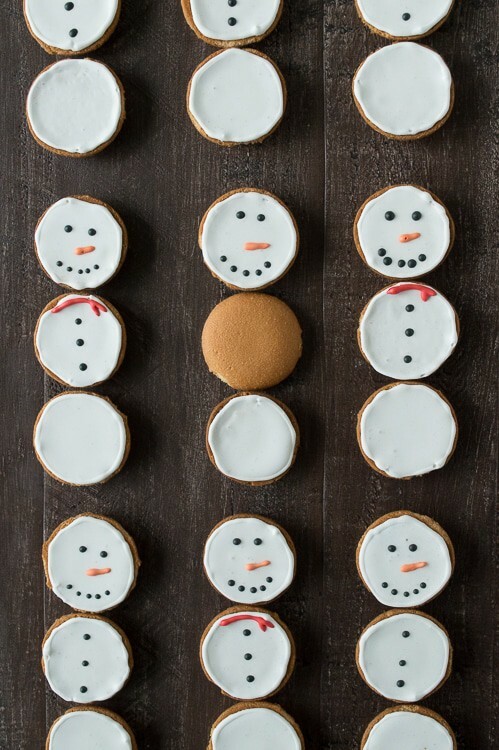 Based on how many snowmen you can create, this will determine how many faces and middles you’ll need to decorate. Split the icing you reserved earlier into 3 smaller containers – color each with a small amount of food coloring – one black for the eyes, mouth and buttons, one orange for the nose, and one red for the scarves. Add those details to the snowmen, using a squeeze bottle. [b]Optional[/b] – add pretzel arms and shredded coconut when displaying the cookies. Store the wafers in an air tight container. 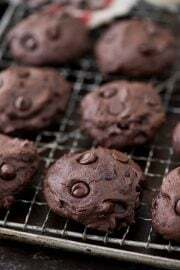 I think these are so cute and I don’t mind that the cookies are more crunchy.. looks like someone already had a few bites! Thank you Laura! I still can’t get over your allergy free gingerbread house though!! Cuteness alert! can’t get enough of your adorable creations. sharing now! Haha, yes, cue the cuteness alert, thanks for pinning Amy! I love it!! Thank you Heather! 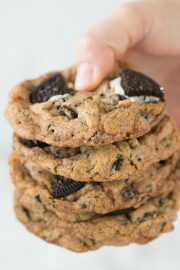 Beth, these cookies just look adorable!! They would be a great project with my niece! Pinned! It’s a good way to practice working with royal icing too! Bath, thanks for making me smile this morning! These cookies are SUPER cute! My kids would gobble these right up! 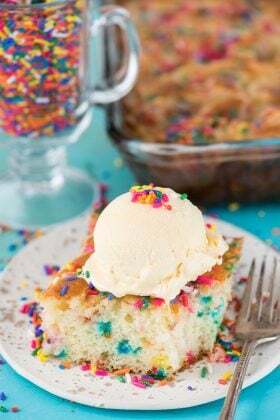 I love all your awesome recipes lately, and this one is especially cute!!! My daughter would love making them! Thank you Sheena! I wanted to come up with really creative ideas for christmas this year! This would be such a great craft to do with the kiddos! Love it! You are too stinkin cute! I don’t know what Dustin would do if I engulfed him with balloons! Probably freak out! ha. And Nilla wafers take me back to when I was little I would eat a box in record time. Probably still would! I know, I want nilla wafers to make gluten free ones!! Of course you could do it Carla!!! Those are so stinking cute!!!! Awwww!!!! Thank you Olivia, that is really sweet! 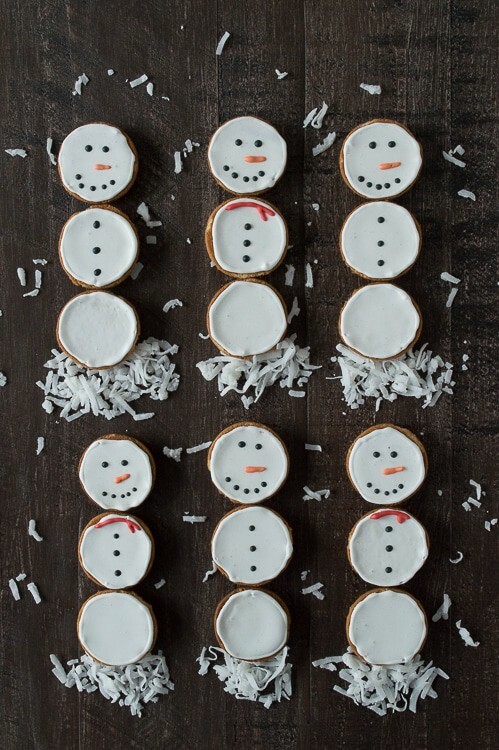 How cute are these snowmen cookies?!! I love the coconut “snow” in the pictures. Pinned! I like that part too, it made them come alive! What a cute idea to wake him up with balloons! 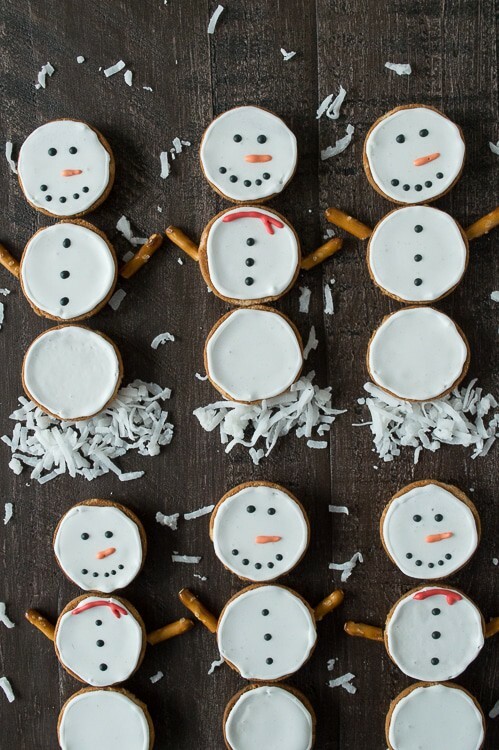 Almost as cute as these snowman! It was really fun, I think it might have to become a tradition! I love that you had 25 balloons for Ryan when he woke up . . so sweet!!! and that he said those balloons are filled with lots of Beth air. . even sweeter!!! 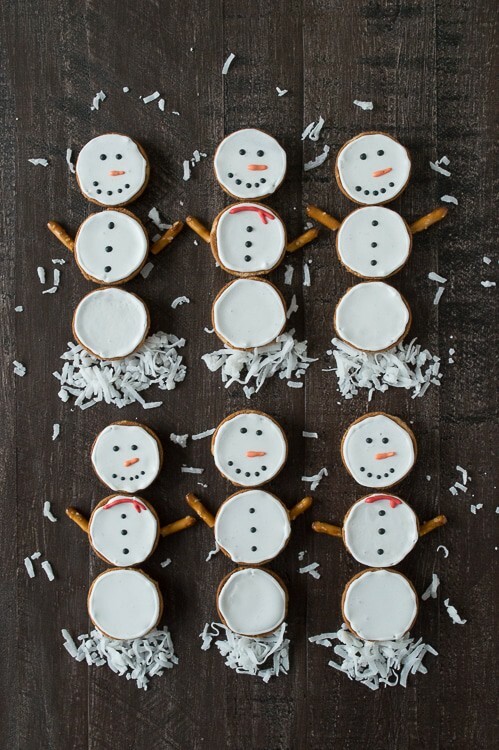 :) and love love love these snowmen cookies!!! my kids love Nilla wafers!!! what a great idea!! love these so much! These are so cute, Beth! And how fun to wake up to balloons! 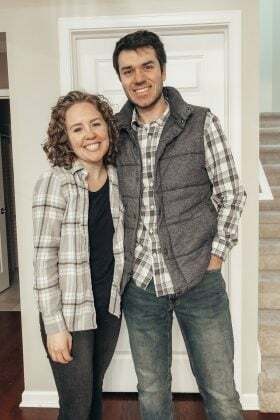 Use that idea with your husband for his birthday! How did you sneak ALL those balloons in while he was sleeping? Great and easy idea for kids to make on their own! Ryan sleeps through anything, even if I turn all the lights on in the bedroom and the water! I love nillla wafers! These are super cute too. Thank you Ali, I love nilla wafers too! These look so cute! Simple too which is perfect for kids! Connie, thank you! I bet kiddos would have fun mixing and matching them too!